Last summer one of my close friends told me that she had never seen Buffy the Vampire Slayer, and I immediately thought, “Well, we better fix that right now!” Every Monday after that, I’d make dinner and we’d watch a few episodes of Buffy. Like most knitters, we enjoyed all of the goofy 90s sweaters in the early seasons, but we both found ourselves admiring the wrap tops above all else. 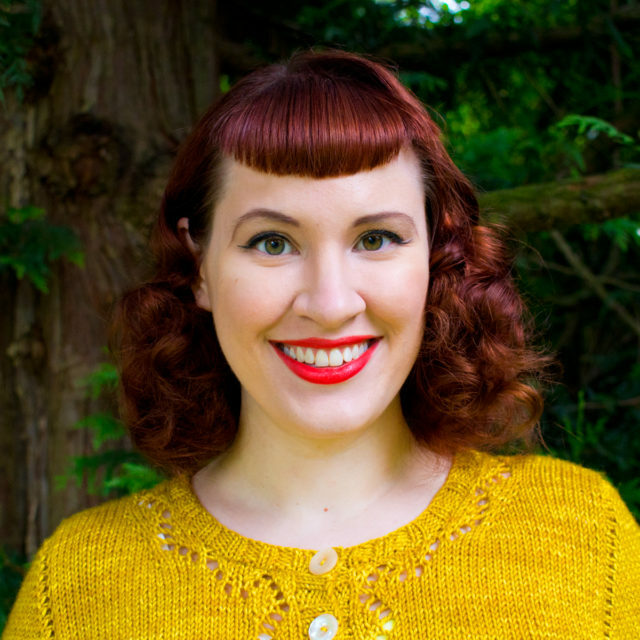 It planted the idea of knitting a wrap-style cardigan in my head, and when I saw the workout outfits with wrap sweaters in season six of Call the Midwife, I knew I had to make it happen and got to work on the idea that would become my new pattern, Anaheim! Translating cut-and-sewn inspiration into a handknit often involves making some changes, and that was the case for Anaheim. 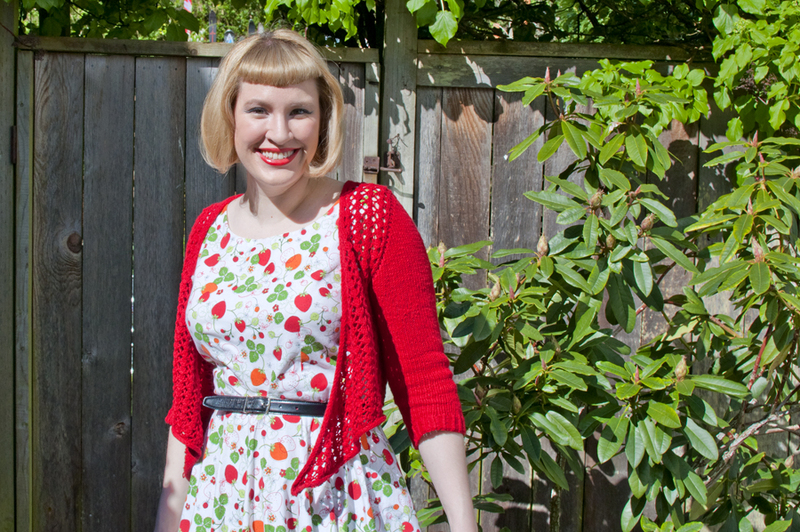 I couldn’t imagine handknit ties holding up well in a soft yarn with all of the abrasion of tying and untying a wrap top, and I finally settled on the solution of buttons on each side to close the cardigan. Not only does this mean that the garment will hold up better over years of wear, but it also allows the cardigan to be worn open. When unbuttoned, the fronts hang down and resemble waterfall fronts to make for a more modern look. Anaheim follows my favorite sweater construction method. The upper back is knit first and then put on hold. The fronts are picked up and knit from the back’s cast-on edge, and the fronts and back are joined when the underarm stitches are cast on. 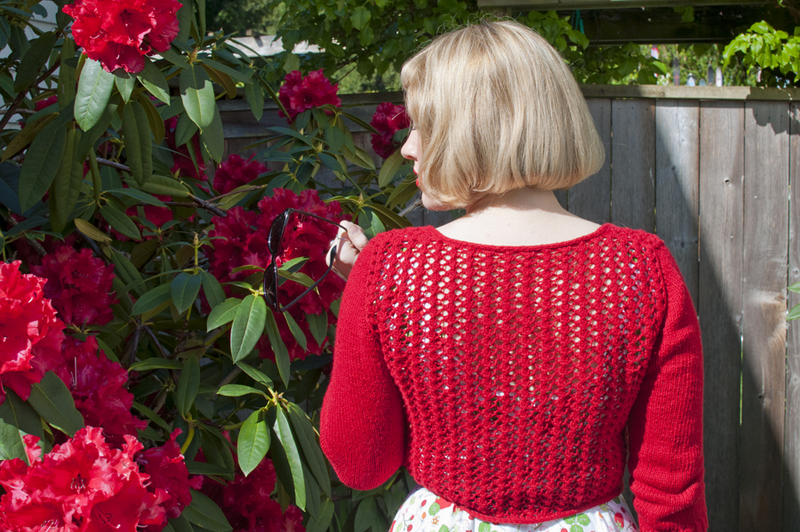 The body is knit with an all-over lace mesh pattern, which is a simple 4-row vertical repeat and easy to memorize. The wrap fronts are shaped by increasing along the neckline edge on every right-side row, so the pattern is fairly intuitive and easy to follow. Some waist shaping is incorporated at each side within a small lace motif that nicely coordinates with the main stitch pattern. A continuous i-cord edging with i-cord buttonholes finishes the bottom edge, fronts, and neckline. 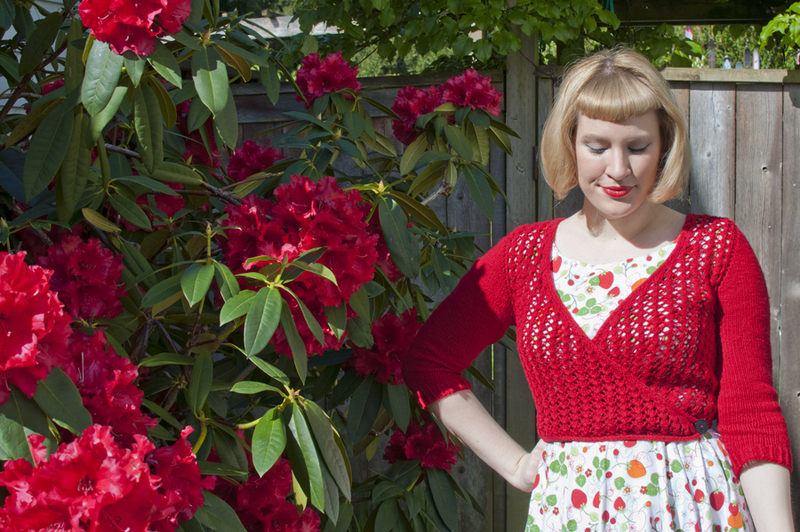 Sleeves are picked up around the armholes of the finished body and shaped using short rows. They’re knit in plain stockinette to keep things simple. The pattern sample was knit in Knit Picks CotLin, a DK-weight cotton and linen blend, but because you can place the buttons according to how much stretch your yarn has, this pattern should work well with a variety of fibers. The pattern comes in seven sizes ranging from a 29 in / 74 cm finished bust to 53 in / 135 cm, and it should be worn with 2-4 inches of negative ease at the bust. You can find Anaheim on Ravelry or in the Untangling Knots shop. P.S. 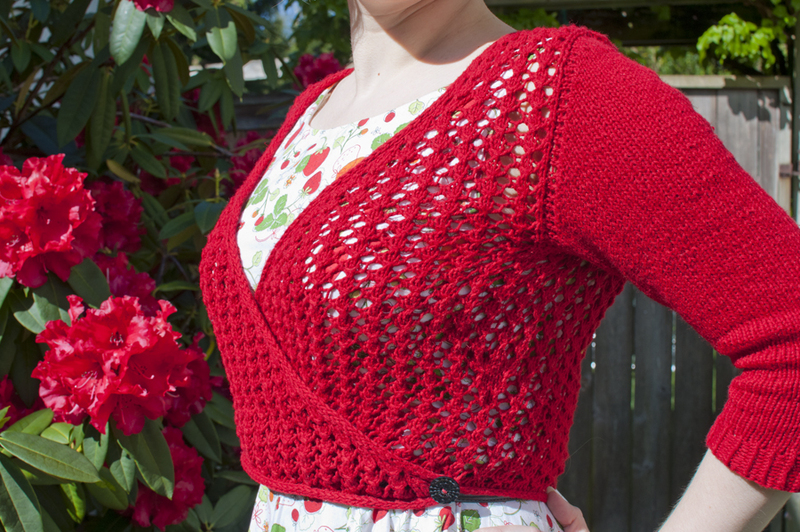 Because this is the official OAL 2017 pattern, you can get Anaheim for 20% off when you use the coupon code OAL2017 when you checkout on Ravelry until June 1st. So sweet. As all your Patterns.